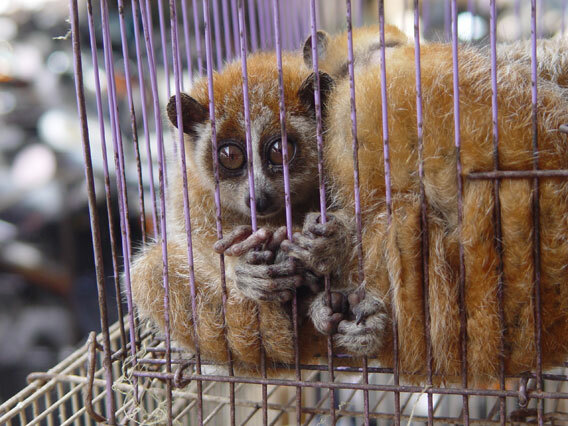 Slow lorises, like these caged individuals, are imperiled in Southeast Asia for the illegal pet trade. In the wild, traders kill loris parents to take their babies. Pet lorises have their teeth pulled out to make them appear 'cuter'. Photo courtesy of the Wildlife Conservaiton Society (WCS). Organized criminal syndicates are wiping out some of the world's most charismatic wildlife to feed a growing appetite for animal parts in East Asia#8212;and so far governments and law enforcement are dropping the ball. This is the conclusion from a new paper in Oryx, which warns unless officials start taking wildlife crime seriously a number of important species could vanish from the Earth. "We are failing to conserve some of the world�s most beloved and charismatic species," Elizabeth Bennett, author of the paper, said in a press release. "We are rapidly losing big, spectacular animals to an entirely new type of trade driven by criminalized syndicates. It is deeply alarming, and the world is not yet taking it seriously. When these criminal networks wipe out wildlife, conservation loses, and local people lose the wildlife on which their livelihoods often depend." Organized criminals are decimating some of the world's favorite species: rhinos, elephants, and tigers are all imperiled by the bloody trade. However, the trade has also hit lesser-known species, such as pangolins, saiga, slow lorises, sun bears, and any number of bird and reptile species. The consequences of this trade are massive: tigers are down to a few thousand survivors, two species of rhino are now dubbed Critically Endangered, the saiga antelope has seen its population drop by 95 percent in two decades, and many forests in Southeast Asia have been described as eerily quiet due to a lack of wildlife. 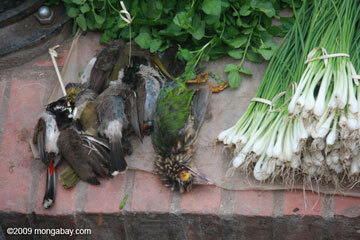 Songbirds sold in a Laos market for food. Photo by: Rhett A. Butler. In the struggle to save these species from the illegal trade, officials are being out-witted and out-funded by sophisticated smugglers who employ the newest technology, clever techniques, and corruption to avoid arrest. Perhaps, even more importantly, wildlife crime is simply not seen as a priority in many parts of the world, where enforcement is lacking and laws are out-of-date. "The trade is large-scale and commercialized: elaborate and costly hidden compartments in shipping containers or below wholesale shipments of sawn timber, fish or scrap products, in which are concealed massive quantities of wildlife products from ivory to bear paws and frozen pangolins. The traders are also light on their feet, frequently changing routes and modes of operation as enforcement commences in any one place, and continually working through the routes and means of least resistance. [...] Trade through e-commerce from web sites whose location is difficult to detect and who operate beyond the current realms of wildlife legislation and enforcement is a further challenge," Bennett, who began her career in conservation more than 25 years ago in Asia, writes in the paper. She now works for Wildlife Conservation Society (WCS). Bennett says the ultimate responsibility for this wholesale decimation of species is due to rising demand for wildlife products in countries like China, Vietnam, and Thailand. In many cases consumers are paying high prices for illegal wildlife products which they believe are curatives. However scientists have shown that animal parts such as rhino horns have no medicinal benefits whatsoever. According to Bennett there is only one way to stop the criminal activity in time to save species from extinction: law enforcement. "Enforcement is critical: old fashioned in concept but needing increasingly advanced methods to challenge the ever-more sophisticated methods of smuggling. When enforcement is thorough, and with sufficient resources and personnel, it works," she writes. Although 'old-fashioned' Bennett says tools such as DNA testing kits, smartphone apps for species ID, and high-tech software for Internet crime need to be employed. Currently enforcement is especially lacking along trade routes and in markets. In many parts of Southeast Asia one can finds illegal wildlife parts sold openly with no fear of punishment. "We must dedicate the intellectual, funding and personnel resources needed to supersede those of the criminal organizations involved," she writes. "This requires greatly increased numbers of highly trained and well equipped staff at all points along the trade chain: most especially in core sites where the species are being hunted but also along key transportation routes and in end markets." 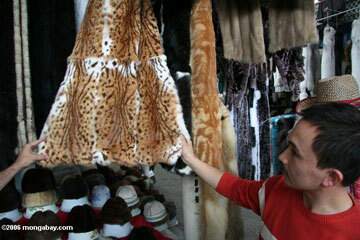 Dealer shows off coats of wild cats in market in China. Photo by: Rhett A. Butler. Laws that were crafted before the current crisis of the illegal trade also must be updated. "We do not have that luxury of time for many of the species currently targeted by trade," she explains. "In the short-term the only practical way to reduce demand is through enforcement, both acting as a deterrent and also demonstrating that this is not a socially acceptable norm," Bennett writes. In the end, the survival of elephants, tigers, and rhinos, along with innumerable other species, depends on law enforcement, the judiciary, governments, NGOs, and the public coming together to tackle the below-the-radar problem. "Unless we start taking wildlife crime seriously and allocating the commitment of resources appropriate to tackling sophisticated, well-funded, globally-linked criminal operations, population of some of the most beloved but economically prized, charismatic species will continue to wink out across their range, and, appallingly, altogether," Bennett warns. CITATION: Elizabeth L. Bennett. Another inconvenient truth: the failure of enforcement systems to save charismatic species. Oryx. doi:10.1017/S003060531000178X.